Welcome to Valhalla, Capital of Callisto, Jupiter’s premier moon, where anything and everything is up for sale. But Valhalla isn’t quite what it says in the brochures – not since Earth granted independence and cut off the supplies. Sylvester McCoy is the Doctor in Valhalla. Valhalla is a very good story that comes incredibly close to being a great one. A fleshed-out setting from a veteran Who writer, a creepy alien race, top notch and slightly disturbing sound work, and a incredible performance from Sylvester McCoy make this serial stand out, but a abundance of padding mixed with a weird turn from the alien race in the third episode pull this story down just enough to keep the brass ring out of reach. 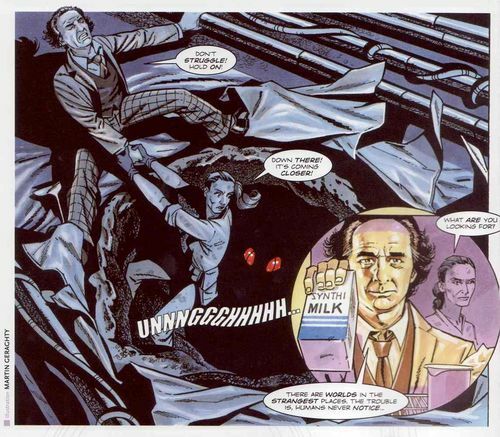 Marc Platt has one heck of a Doctor Who pedigree – he wrote one of the quintessential Seventh Doctor stories, Ghost Light, as well as one of Big Finish’s best productions ever, Spare Parts. Oh, and he also penned a personal favorite of mine, Loups-Garoux. Platt’s major strength is his ability to establish a strong setting with just a few words from the characters. It doesn’t take very long for the listener to recognize that Valhalla was abandoned by Earth once its natural resources ran out, and has been struggling ever since to maintain its very existence. It is an open market where everything and anything is for sale, but there’s still a modicum of control held by the central authority. Everyone coming into the city is cataloged with a barcode on their tongue listing their identity, skills, and talents, and riots are scheduled on a regular basis, complete with complementary armor and weapons, to allow the residents to blow off steam in a controlled atmosphere. Platt also easily lays out the Doctor’s melancholy as the Time Lord struggles with bureaucracy and his desire to just sit down for a bit and let the universe go by. One would hope that this character establishment would extend to the central villains of the piece, an army of giant termites led by a queen known as Our Mother. Indeed, the threat of this army is laid out in grand fashion, as they chew through anything to get to their victims, easily pick up entire buildings on their backs to move them across the city, and once Our Mother is revealed to also be the city’s central computer known as Registry, able to track the Doctor and his allies anywhere in the city, easily blocking their escape routes and “encouraging” the Doctor to allow himself to be escorted to her. The termites and Our Mother were well on their way to being one of the more memorable foes in Big Finish’s history, by the AMAZING performance of well-known British actress Susannah York at the queen determined to ensure her species survive by the most nefarious means possible – pure capitalism. York plays up the “divine right” of the queen and her pure insistence that humanity gave up on Valhalla a long time ago and she can do with Earth’s castoffs as she pleases. Her performance is only enhanced by some great voice modulation. It’s one of those times where everything was so close to clicking with Our Mother and her army. Until the third episode, when the Doctor uses the TARDIS’ translation circuit in an attempt to blend in with the termites, and it turns out the termites sound exactly like a group of Tottenham Hotspur supporters. The fear and unease brought about by Our Mother’s insectoid army goes right out the window as they termites act like a bunch of blue collar squaddies, joking with each other and asking the Doctor “hey, what’s the big idea” when he doesn’t know the password. It just took me right out of the story, an extended moment of humor whose presence was completely out of place, especially as the mood snapped right back to tension and fear in the fourth episode. I was expecting the xenomorphs from Aliens hissing and snapping at the Doctor as he tried to bluff them. Instead, I got the xenomorphs from Aliens: Colonial Marines walking the dinosaur. 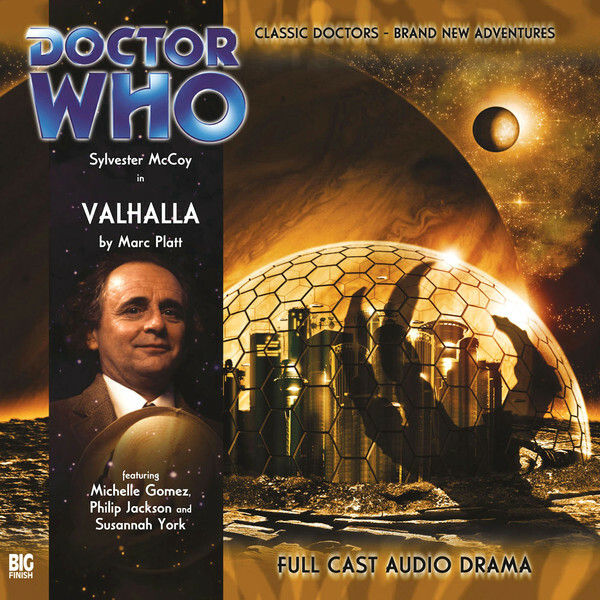 Valhalla is, put simply, one of Sylvester McCoy’s finest performances for Big Finish. After a brief step back in Nocturne, Valhalla sees McCoy return to form in very dashing style! This is a Seventh Doctor at the end of his days, somewhere between Master and the 1996 television movie. No Ace, no Hex, no Melanie Bush…he’s alone, a lonely man in a blue box, toppling empires and no longer mixing metaphors. His arrival on Valhalla is for one simple reason – he wants to semi-retire, to lean back and let someone else take charge for a bit. Instead of going about time and space solving problems, people can come to HIM. It turns out, of course, that there’s more to the Doctor’s interest towards cashing in his karmic 401(k). But for those moments, McCoy is simply superb. You can hear the weariness in his voice and the surprisingly lack of anger at dealing with Valhall’s government. Even his fury towards Our Mother seems to lack a certain spark at times as one could almost hear the Doctor sighing to himself as he deals with yet ANOTHER genocidal maniac. As the story progresses, the little moments of Seven come out – jokes towards his temporary companions, comments about how “watertight plans always spring a leak,” and even an offer for someone to join him on his travels once the crisis his averted…and the despair in McCoy’s voice at the very end, when said person turns him down, is just heartbreaking. The secondary characters are mostly serviceable. There’s Laxton, played by Phillip Jackson, who is the administrator of Valhalla and subverts the “corrupt official” role by trying to do his best to serve the people of Valhalla, even going to far as to offer to sacrifice himself to save the citizens. Donna Berlin’s Tin-Marie and Fraser James’ Gerium serve as the minor characters who are sounding boards for the Doctor, with James having a nice turn as the “anything to save his skin” type who grouses his way towards doing the right thing. The highlight of the secondary cast, however, should come as no surprise. The technician Jevvan is played by none other than Michelle “Missy” Gomez, appearing in a Doctor Who production eight years before the premiere of Deep Breath. Gomez is solid in the role as the temporary companion, someone who wants to save her friends and do the right thing and slowly, thanks to the Doctor’s influence, gets a chance to do so. Gomez hits all the appropriate notes, being scared, brave, resourceful, and both in awe and afraid of the Seventh Doctor. Anyone who’s seen her turn as the Master will recognize her in the role almost immediately, and it’s definitely a neat little piece of history to hear an actress who plays a major television role make her debut almost eight years earlier, kind of like hearing David Tennant in Colditz and Medicinal ”Jamie famous!” Purposes. Platt spins a great story, and Valhalla is a serial I wish had produced in the three-parter/one-parter format. The story before this one and the story after this one (Exotron and The Wishing Beast) both utilizes this style. Valhalla suffers from a third episode where there’s a lot of running around and the Doctor yelling at Our Mother with very little actual plot advancement. Don’t get me wrong, I could listen to McCoy get indignant at a villain for two hours, but the scene with the termite squaddies wasn’t necessary and could have easily been trimmed. And it’s especially jarring when the solution to the whole entire problem is simply the Doctor getting on the city’s public address system and lying to the termite army, telling them that their queen is dead and causing them to swarm into the air and leave Valhalla in an effort to find a new queen. More time is spent on Our Mother’s slow demise than actually defeating her, and it feels like her defeat is pure deus ex machina. If Platt had spent more time on the climax than on the squaddies, Valhalla would have been much better off. I feel like I’m being a bit unfair towards Valhalla. In the end, this IS a damn good story from Marc Platt with a Doctor we haven’t quite seen before, Michelle Gomez being solid, a unique setting and a terrifying enemy. The fact that it comes SO close to being a great story is just incredibly frustrating and makes its flaws stand out even more, with an episode of padding spent on a strange turn in the characterization of the bad guys. Still, Valhalla is worth a pick-up, as it’s one of McCoy’s best performances as the Doctor while still managing to convey a sense of dread and unease during its runtime. Cobi’s Synopsis – Valhalla could have been a classic save for too much padding and some mischaracterizaton of the alien enemy, but still turns out to be a very good story from Marc Platt, thanks to great turns from Sylvester McCoy, Michelle Gomez, and Susannah York. Next up – What can it mean when the Doctor and Mel are drawn to an asteroid by a message from the strange, elderly Applewhite sisters? This entry was posted in Big Finish Review and tagged Big Finish, Big Finish Audio, Big Finish Review, Doctor Who, Doctor Who Audio, Doctor Who Review, Michelle Gomez, Seventh Doctor, Sylvester McCoy, TARDIS. Bookmark the permalink. I remember being unexpectedly pleased with this story when it came out though I do agree that it might have been better served as a three parter. Philip Jackson and Susannah York are both wonderful and I’d forgotten Michelle Gomez was in this. I’ll have to play it again soon!